It is the mission of the Mason General Hospital Foundation to further the mission of Public Hospital District No.1 by enhancing the quality of healthcare enjoyed by patients of Mason County by providing financial support to Mason General Hospital & Family of Clinics (MGH&FC). Mason General Hospital Foundation is a 501(c)(3) charitable organization. MGHF's Tax ID Number is 91-1529293. The MGHF Brochure offers more detail about the foundation's philanthropic efforts. Quality Care Open Golf Tournament - Celebrating 25 Years in June of 2019! For more information about MGHF please see our MGH Foundation Brochure. 3D Mammography Services - Now in Service! As technology in healthcare improves and the population ages, the public places greater demands on hospitals. At the same time, insurance providers, including Medicare and Medicaid, are paying less to hospitals, making the need for support from organizations like the MGH Foundation more and more important. Every year Mason General Hospital Foundation receives gifts designated by the members of our community through their wills. Some of these donations the Foundation is aware of, while others come as a surprise. Either way, all gifts are appreciated and used to help enhance local healthcare. To these people we say, thank you! Throughout the year, the Foundation welcomes the opportunity to recognize and thank Foundation donors - whether privately or through membership in the Enduring Flame Society. If you have designated a gift to MGH Foundation and you would like us to be aware of it, or if you are interested in learning more about how you can make an estate gift to the Foundation, please contact Jennifer Capps, chief development officer at (360) 427-3622. MGH Foundation thanks all of the members of our community who choose to contribute to the Foundation throughout the year. In 2013, MGH Foundation donated $151,800 of its proceeds to purchase new medical equipment and remodel the Physical Therapy Department at MGH. More than $40,400 of it was raised through the fund-an-item portion at the Fantasy Forest Gala and Auction to go toward the purchase of a new Skytron 3600 B UltraSlide surgical table. Also included was Treasures Thrift Store’s donation of $96,000 toward the purchase of the new Ultrasound Machine, and $15,400 came from the Foundation’s Endowment Fund. The Endowment contribution was used to pay for part of the remodel of the Physical Therapy Department at MGH, which will help to increase access for pediatric patients in our community. 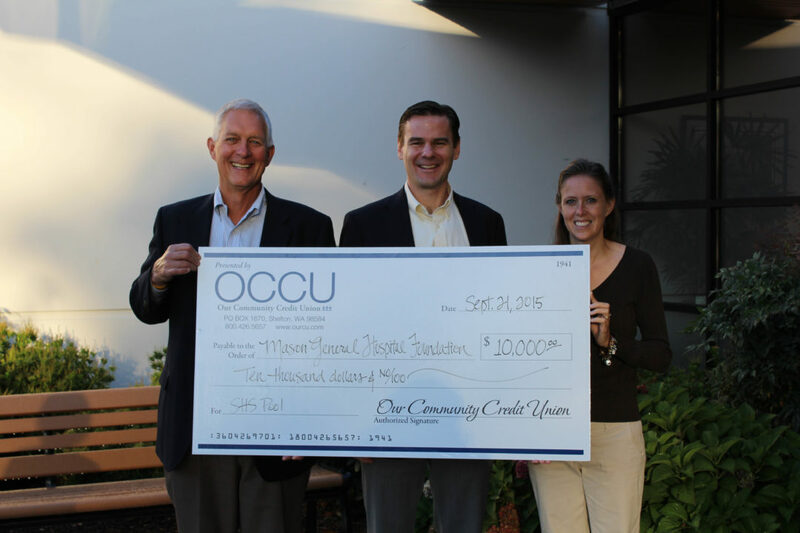 Our Community Credit Union (OCCU) has helped SPLASH (Support & Preserve Lifelong Aquatic Safety & Health) to meet its funding goal with a contribution of $10,000 to go toward the immediate repairs required to keep the Shelton community pool open. Working on a tight deadline to assure the completion of the repairs needed to maximize utilization of the pool by community members, students and local swim teams, SPLASH feverishly raised money to fund the construction work needed to keep the pool in operation. The immediate repairs cost a total of $177,000. Working with the community, SPLASH has directly raised over $100,000. To read more about this incredible donation, click here! Make an online gift fo MGHF's Fund-An-Item Campaign! Help fund 3D Mammography Services for your local hospital and family of clinics. Make a gift now through PayPal by clicking the "Donate" button below. Make an online gift to MGHF’s Annual Giving Campaign through PayPal by clicking the “Donate” button below. Mason General Hospital Foundation is raising funds to to ensure quality healthcare for the generations of today and the generations of tomorrow for Mason County residents. You can continue to support our community year after year - FOREVER!